Justices of the Texas Supreme Court. A federal judge has rejected a race-based challenge to the way Texans fill seats on the state’s highest courts. U.S. District Judge Nelva Gonzales Ramos of Corpus Christi handed the state of Texas a win Wednesday, writing that its current method for electing judges to the Texas Supreme Court and the Court of Criminal Appeals does not violate federal safeguards for voters of color. The system does dilute the power of Hispanic voters, Ramos wrote. But it’s not clear that “race rather than partisanship” explains why Hispanic voters’ preferred candidates tend to lose at the polls. Seven Hispanic voters and a community organization sued the state in 2016, arguing that Texas’ statewide judicial election system violates the federal Voting Rights Act because it weakens Hispanic voters’ political clout and keeps them from electing their preferred candidates. Both high courts have been entirely dominated by Republicans for more than two decades, and both courts remain overwhelmingly white. The state, meanwhile, argued that the makeup of the courts is explained by changing political preferences. Lawyers from the Texas Attorney General’s Office pointed out that the two high courts have seen a complete partisan shift in the last four decades: Democrats dominated the courts until the mid-1990s. “Partisanship explains these patterns — not race,” Patrick Sweeten, the state’s lead attorney, said during a February trial in Ramos’ courtroom. Lawyers for the plaintiffs pointed to a long history of Hispanic judges losing races for the Texas Supreme Court and Court of Criminal Appeals — even with the advantage of incumbency. Voters’ preferred candidates don’t have to be of their same race or ethnicity, but that is often the case for Latino voters, they argued. “The courts cannot be the great equalizer of our social fabric when one group — Latinos — are disadvantaged in the election process,” Jose Garza, an attorney representing the voters, told Ramos in February. Texas Attorney General Ken Paxton cheered the news. 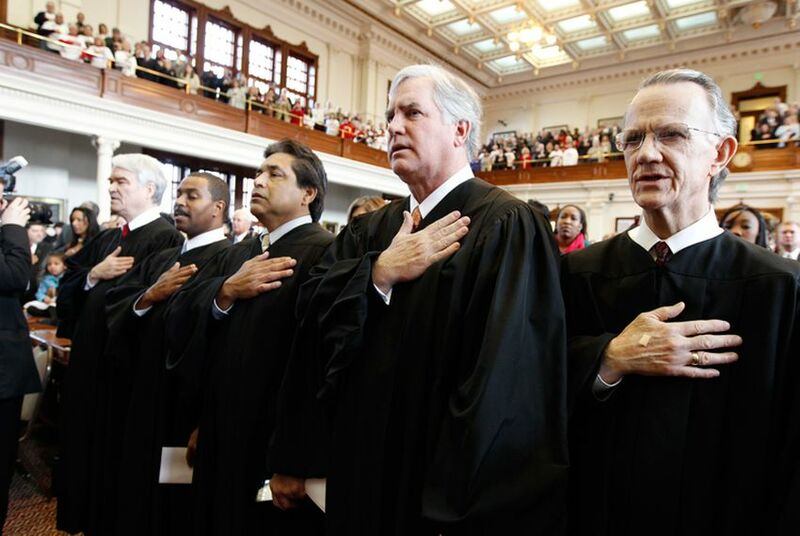 “Texans have been choosing the courts’ highest appellate judges in statewide elections for 142 years, and this system supports the state’s interest in maintaining judicial accountability and independence,” Paxton said in a statement.